A thought occurred to me when watching this game: Sporting Kansas City has to look a lot like a prototype of what Oscar Pareja wants out of his teams. From the formation to the high-pressing, KC has long made their money by manhandling opponents as soon as they get on the ball and not letting them get comfortable. In this game, Sporting came out fired up at home and simply punched Dallas in the mouth (not even completely a figure of speech - this game was brutally physical). 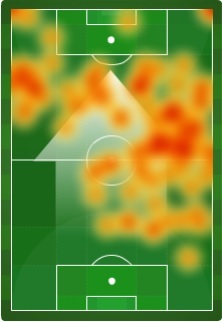 The high-pressing from KC's entire team had FCD out of sorts for most of the first half, particularly the first 30 minutes, when they mustered only 41 completed passes. But the Hoops managed a road draw against the defending champs, so the game wasn't completely a story of getting worked over. As the game wore on and Sporting found it difficult to keep up the constant pressure, Dallas was able to grow into the game a bit. They certainly were never dominant, but another very good game from Mauro Diaz and some smart counter-attacks allowed Pareja's team to stem the tide for the majority of the game. In the end, it was fitting that the slugfest of a game saw just two goals, both from set pieces, but Dallas should feel good about how they played as the game progressed and were able to steal a point. Sporting KC won MLS Cup last year and has unquestionably been one of the league's best teams for the last few seasons. But few would argue that this success is built on a very strong defense and midfield. The forward line has often been sort of an Achilles' heel for this squad, especially now that Kei Kamara has moved on. In this game, Graham Zusi was held out so he could stay fresh for CONCACAF Champions League action, and DP forward Claudio Bieler only came on for the last 13 minutes. 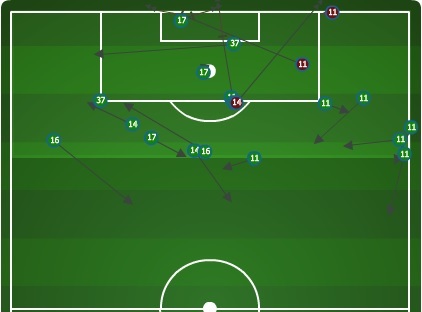 But the five players who saw time at a forward spot for KC (Bieler, Dom Dwyer, Sal Zizzo, CJ Sapong and Jacob Peterson) combined to register 15 offensive actions in the attacking third. To be clear, that 'offensive actions' stat that's illustrated above might have been made up by me just now, but it encompasses successful passes, dribbles, and all shot attempts. Too often on Saturday, and really for the last few years, Kansas City has dominated the game until the last thirty yards of the field, where they lack ideas. Getting Zusi back will likely help, as would playing Claudio Bieler for a full 90 minutes, but Sporting will need some more creativity and production from their forwards if they hope to lift another trophy this season. I tuned in for the Chivas-Vancouver matchup excited to see an offensive battle between two sides that combined for 7 goals in week one. Instead, I saw an early red card to the Goats' Agustin Pelletieri followed by a lot of dull possession for Vancouver against a surprisingly organized team in red and white stripes. After looking so deadly in attack against New York, the Whitecaps looked completely lost for ideas on Sunday, with the only forays into the offensive third seeming to come from chips over the top from the superb Pedro Morales. That all changed when Kekuta Manneh came on, as he attacked the Chivas defense with and without the ball, causing fits for Eric Avila and eventually scoring the equalizer for the 'Caps. Still, after playing 87 minutes against 10 men, Vancouver has to be rightfully disappointed at only earning a point. The Seattle Sounders traded Mauro Rosales to Chivas this offseason because he was too expensive and too old to fit into the club's plans for 2014. Nobody even really argued with the decision, though Rosales is undeniably a classy player and won the league's Newcomer of the Year award in 2011. So far in 2014, playing in the red and white of the Goat Zombies, Rosales has looked a lot like the 2011 playmaker that Sounders fans knew and loved. Playing down a man, Rosales was everything you could hope from a smart, skilled veteran; he hoofed it up field when in trouble so his team could get organized, he led smart counter-attacks and he kept the ball when possible (with the help of Erick Torres, who also played very well). All in all, he registered 151 actions in Opta's chalkboard, 12 more than any other player and a whopping 47 more than his nearest teammate. Not bad for a washed-up 33-year-old. I've watched about 120 minutes of Montreal Impact soccer in the season's first two weeks, and just about every one of those minutes has been more impressive than I expected from the Impact this season. Despite having zero points from their first two games (both on the road), they've actually looked pretty good on the field. Justin Mapp is doing Justin Mapp things (like this awesome run & assist from week 1), Hernan Bernardello and Patrice Bernier are pinging beautiful balls to open up space, and Felipe and Andrew Wenger are getting in pretty good goal-scoring spots. So what's the reason behind the zero points? Well, not putting chances away against the Dynamo killed Montreal. ASA's shot numbers had their xGF at 1.15 this week, but there were plenty of other times that they wasted dangerous opportunities (one particular Wenger near-breakaway early in the first half stands out). If All-Star Italian striker Marco Di Vaio wasn't suspended, I have a hard time believing the Impact gets shutout last week. This was another game where what I ended up watching did not line up with the expectations I had going in. After an open, attack-filled opening game with New England, Houston came out and didn't really do much offensively against Montreal. It was actually sort of a gameplan of old-school Dom Kinnear, as the Dynamo got an early goal thanks to a deflected Will Bruin shot, and then packed it in and made themselves hard to beat. They sat in two organized banks of four so that only the perfect ball from Montreal would be enough to beat them, and when it looked like they might get beaten, they did the professional thing and took a foul. Eight of Houston's 14 fouls conceded were in their defensive third, and while I can't offer much perspective on whether that's a high proportion compared to league average, I can tell you that many of them occurred when Montreal players were breaking away and getting ready to provide a scoring chance. I spent some time this week riding a few planes and doing my cross-country travel thing with the family. That means a lot of distractions, which in turn leads to time reading nerdy books and listening to podcasts. I'm not sure if it was just that the Sporting KC machine was on full crisis mode or what. I happened to catch 4 different podcasts (including our own...btw what a job Drew & Matty did without me, huh? Proves I'm expendable...) talking about Sporting and their lack of ability to facilitate a goal in the Champions League at home. Obviously that's a big deal, in part because they look to be one of the teams that will proceed on to the quarter finals next spring and continue to represent MLS. But despite them sitting pretty in the CCL and third (using points per game) in the table for the Supporter Shield, a couple of podcasts basically forecasted that they would fall a part without a "proven scorer" now that Kei Kamara has departed. Now, I have to say that I've been mildly impressed with them as a team, and their pack of forwards---featuring Claudio Bieler, Soony Saad, CJ Sapong and the recently returned Dominic Dwyer---make for an interesting four-some. That isn't including Teal Bunbury who made his return to the club after being out for a year-long rehab with a torn ACL. My immediate reaction two weeks ago was to question the transfer the deadline deal and transfer of Kamara three weeks ago. I spent a day putting some thoughts together and then second-guessed myself that I was maybe naive. They've got quite a few weapons, and the added play of Benny Feilhaber---who admittedly I've never been a fan of---stepping into the void left by the departure of a six-foot, three-inch winger from Sierra Leone has been big. Their string of results (9 points in 3 games) made me think I was being silly. Then today, while on the road from Atlanta, a thought crossed my mind and I decided that I would take a closer look at the numbers. I collected shot data for the matches Kamara participated in (and to the minute he was subbed in) as well as the games Sporting played without him, and I built myself a nifty little spreadsheet. Now, before I throw these numbers at you, there is the need for a little asterisk to all this work. I'm sure it's already understood, but if not, let me make it clear: these numbers are very vague and there is still quiet a bit of noise involved. How much, I'm not sure. It's just important to recognize the difficulty of trying to measure what a team does with and without a single player, and extract the difference. I would love to quantify everything, but everything is currently unavailable. This is a very simple method in a very small sample size of a context. And then again... only without him. You can see pretty the numbers plainly that the are overwhelmingly in the favor of Sporting being a better team with Kamara. And I don't think anyone would argue against it. However, the difference between the two teams should be questioned as it's possible the numbers are a result of the different system in which coach Peter Vermes implements with Kamara opposed to how he configures the team without his former star forward. I think the big stat that stands out to me is the number of goals allowed per 90 without Kamara in the starting XI. Which is pretty crazy, considering that the club actually surrenders less shots with Kamara in the line-up: 6.7 with vs. 7.4 without. This is what leads me to believe that A) the team plays a different style without him and B) that it may not be sustainable. I wasn't on the crazy train with thinking that Sporting has all these problems and is going to eventually fall apart. I'm still cautious enough that I'm still waiting to see if they'll make a move towards the Supporters Shield with their remaining 5 matches in the season. Their shot ratio, even without Kamara, would still be best in all of MLS. So it's hard to simply throw crazy statements that this team is that much worse without him. The bigger issue at hand for me is that Sporting was a force with Kamara. Without him, they're simply another good team in league filled with good teams. Both are sets of clubs (with and without Kamara) that are capable of winning silverware. That said, this really leads you to question why Vermes would sell off such a significant difference-maker overseas with a real shot at making a run for multiple cups at this point in the season.